Married couple of Will Long and Danielle Baquet-Long, more well-known as ambient project Celer has recently released its next work under the title Breeze Of Roses on label Dragon’s Eye Recordings. By the way word “next” isn’t accidental here. Analyzing the tempo of these people’s releases (on their own label Celer as well as by other releasing companies) there appear a reasonable suspicion whether these releases are really self-sufficient and interesting as one separate musical item. Unfortunately, in the case with Breeze Of Roses this suspicion proves to be right. This album is just the next nice ambient release, neither more nor less. Rather pleasant but absolutely not unique… On the cover one can find the names of instruments used (cello and mini piano recorded live inside a small sailboat). Though these instruments are almost indistinguishable in the common tangle of hazy, enveloping sound – music for afternoon dream, drowsiness or background of calm pastime. Fans of this genre can listen to this album with pleasure though something interesting and catching can hardly be found here. We can’t hear anything that would leave some taste. Modern ambient is sometimes lack of such taste so much. The blurb to Breeze of Roses by husband and wife duo Celer (Will Thomas Long and Dani Baquet-Long) paints a romantic and alluring picture of the album’s genesis, born from a long weekend spent on the banks of Lake Attersea in Austria, late 2005. ‘During a break in a rainstorm, a one-hour recording was made in the belly of a docked sailboat, consisting of mini-piano, whistles, and a cello’. A parallel field recording was also produced, capturing the sound of water beating against the hull, and the surrounding winds. The recordings languished until 2007 when Celer resurrected them and, informed by fond memories, reprocessed them into Breeze of Roses. Sadly, none of the above descriptors is evident upon listening, such that I was concerned I’d put the wrong disc in the player. Breeze of Roses is one long, hazy drone, a windswept, near-static low-end hum akin to Thomas Koner feeling cosy, or Windy and Carl feeling glum. Over the course of 47 minutes it undergoes subtle shifts in tone and colour, with ocassional faint tinkerings cutting through the fog, so faint they’re more inferred. The single track is loosely divided into six ‘imprecise’ parts, given further abstract, evocative titles (‘The Archaelogical Aspects of Grief’), yet the start and end points of these are impossible to determine. What happened? Where are the instruments, the mini-piano, whistles, even the water? All I hear is wind, a possible cello, and a whole lot of processing. It’s far from unpleasant, particularly those moments where change and activity can be detected, and best played at high volume, but also far from what the notes indicate, and ultimately a genuine disappointment given the rich potentialities offered by the source material. The back-story behind Celer’s Breeze Of Roses tells of how the duo (Danielle Baquet-Long and Will Long) were holidaying on the banks of Lake Attersee in Austria when they were caught in the midst of a rainstorm. Taking shelter in a docked sailboat, the pair set about recording some simple tones generated by a mini-piano, whistles and cello. Additionally, field recordings were made to capture the sound of water buffeting the bottom of the boat and wind billowing through an open hatch. Divided into “six imprecise parts”, this three-quarter hour composition was worked on over the course of two years, shaping the piece into a continuous stream of beautiful stretched-out harmony that cruises softly along a trajectory of dynamically varied sustaining tones. It wouldn’t be unfair to suggest that there’s something peculiarly inert about Celer’s music next to so many of their drone-weaving contemporaries, yet despite the high level of abstraction, these amorphous passages often resemble the sort of music spun by Stars Of The Lid, or perhaps Stephan Mathieu at his most epic. Sterling work as ever from the duo – highly recommended. There’s also a geographical dimension to Breeze of Roses, which began when Celer spent a weekend on the Austrian banks of Lake Attersee and, while on a docked sailboat, produced a one-hour recording using mini-piano, whistles, and cello. Field elements found their way into the recording too, specifically the sounds of water thumping against the boat’s underside and wind howling outside an open hatch. In 2007, Celer revisited the by then two-year-old recording and restructured and processed its contents into the forty-eight-minute Dragon’s Eye release. In contrast to Engaged Touches, Breeze of Roses downplays the “real world” aspect of the release and instead transmutes those originating sounds into a largely synthetic-sounding and ethereal weave of wavering tones (the faint rustle of environmental noise is occasionally audible but faintly). Though the work includes six “Imprecise Parts”—“Crouched in Elysian,” “Quaggy Staircases in Rock Walls, ” “The Archeological Aspects of Grief, ” “Organs of Perception, ” “The Ordinary Intellect, ” and “The Scent of Confusional Arousal”—it unfolds as an uninterrupted vista of softly stirring sound. Curlicues of wind gently blow across the tonal drift at around the thirty-two minute mark and a slight hint of industrial noise simmers near-imperceptibly below the surface elsewhere, but Breeze of Roses sonically suggests the empyrean more than any earthly locale. “Breeze of Roses“ (Dragon’s Eye), on the other hand, leans more towards the sensual and tactile and makes for an ideal bridge between the early dronework of the the duo and their later tendency of zooming in on the natural timbres of acoustic instruments. It is also almost certainly the Celer album with the most original background story: Recorded in the refuge of a sailboat’s belly in the middle of a roaring rainstorm, the first draft already featured Cello parts and Piano passages. In the second phase, a full two years later, the piece was re-arranged and enriched with additional on-site field recordings. The outcome is a shimmering stream of pulsation, billowing and ebbing away in almost sensual patterns. It was to be the beginning of a fruitful relationship with the label, which had already scheduled “Dying Star“ for a 2010 street date. La noticia se hizo pública el pasado 9 de julio, a través del propio blog de Celer. Allí, un desolado Will Thomas Long contaba que su compañera de sábanas y de grupo, Danielle Baquet-Long, había muerto el día antes a consecuencia de una extraña enfermedad genética. Simplemente, se le paró el corazón. La historia es sobrecogedora y un poco macabra, porque Dani apenas tenía 26 años y llevaba una vida sana, y esa es una circunstancia que nos convierte a todos en víctimas potenciales, especialmente si somos más viejos o llevamos una vida menos (ejem) sana. Pero sobre todo es una noticia triste, porque tras cuatro años germinando en el vergel de sellos diminutos y exclusivos en el que se ha transformado el universo de la música electrónica, Celer se había convertido en una de las grandes esperanzas del ambient, en una de sus voces más originales y personales. A Celer ya los presentó por aquí Javier Blánquez hace unos meses, así que ahora sólo recordaremos que la suya es una carrera trufada de referencias (tienen la bendita manía de publicar discos a puñados, casi siempre en sellos minúsculos y tiradas limitadas), y que por eso todavía verán la luz algunos títulos que tenían terminados. Students Of Decay, por ejemplo, acaba de lanzar “Poulain” y “Fountain Glider” (no pierdan el tiempo buscándolos: se agotaron a las pocas horas de salir a la venta), sellos como Infraction, Dragon’s Eye Recordings o Smallfish tienen en cartera material para publicar, y es de suponer que Will exprimirá sus discos duros durante los próximos meses, aunque sea como homenaje a su señora. Precisamente en Dragon’s Eye Recordings es donde vio la luz hace poco uno de los mejores discos de la pareja, “Breeze Of Roses”. Como todo lo suyo, incorpora grabaciones de campo, instrumentos acústicos y mucho procesado digital, elementos que se funden dentro de un magma ambiental repleto de miniaturas electrónicas y pequeñas filigranas melódicas; un magma que, como sucede en los grandes discos de ambient, está siempre en movimiento, aunque parezca que no cambia. Lo que hace tan especial al disco, en realidad, es la historia de su gestación: las grabaciones que lo componen provienen de una improvisación que la pareja realizó, en 2005, en el interior de un barco atracado en el lago Attersee, en Austria. Los instrumentos utilizados fueron un pequeño piano, un chelo, campanitas y silbatos, pero también decidieron grabar el ruido del viento en el exterior del lago y el sonido que producían las olas al chocar con el casco del barco. Un material en bruto que los Long han ido puliendo durante años, esculpiendo poco a poco, hasta reunir las seis piezas que conforman el disco. Seis piezas que eluden la idea clásica de estructura (aunque en las tres primeras subsisten ciertas trazas de música compuesta, posiblemente algunos retazos melódicos que surgieron durante la improvisación), en favor de un concepto más abierto e indefinido, en el que los sonidos entran y salen de la mezcla con pereza y displicencia, dibujando a base de ecos la postal del momento en que fueron creados. Y es que, como en aquella escena de “Ratatouille” en la que el crítico gastronómico regresa a la infancia tras probar un sencillo bocado de cocina tradicional, aquí basta pulsar el botón de play para sentirse transportado al viejo barco en el que comenzó toda esta historia: Danielle se ha marchado, es cierto, pero sus memorias permanecen más vivas que nunca. Unbelievably, the caressing sounds that constitute the whole structure of this tenderly engulfing music were obtained by the extreme processing of a recording that Will and Dani Long made in 2005 during a weekend on the Lake Attersee in Austria – in the belly of a docked sailboat, of all places. The basic constituents are a mini-piano, whistles, cello plus the “thumps and thuds of water against the bottom of the boat and the wind howling outside of the open hatch”. You won’t be able to discern practically anything of these factors, though, as the 48 minutes of Breeze Of Roses are a wonderful reminder of how the notion of “ambient” was born: persistently cuddling drones whose tonal tissue changes just that necessary bit to guarantee that the sound lives and flows, perfect for infinite-repeat spinning, a delight in an evening where the tiredness of the mind and a general inclination to the non-assimilation of overly complicated concepts create the ideal terrain for total relaxation, still maintaining the human insightfulness that the couple has grown us used to over the years. One of the genre’s best releases in recent times. Certainly you have heard of Celer, maybe you have dealt with one or some of their releases, parts of a considerable discography achieved in five years. This one includes (so far) about thirty works: restricted to the first half of 2009, Will Thomas Long and Dani Baquet-Long (the married couple behind the project) have already realized seven discs (without considering “Four Pieces / Three” on Smallfish, next to be published), among which “Capri” (fascinating and evocative, recorded in the Italian isle) and “Engaged Touches” (all the shades of Celer’s world here). “Breeze of roses” is dated March 2009, but its origins go back to four years before, outcome of a visit to the Lake Attersea in Austria, where Will and Dani collected recordings using mini-piano, whistles and a cello. These recordings have been resumed and reworked later (in 2007). The result is a unique piece (over forty-seven minutes) which the duo indicates as decomposable in six parts. In fact it’s impossible to detect distinct movements, given that the sequence flows quite uniformly throughout all the duration. The track opens with landscapes made of echoing patterns, waving like water (one of the elements captured on the scene, another is the blowing wind). Round about the eleventh minute the atmosphere becomes more colourful, a subtle melody creeps into it, the tones are now intense, the echoes more defined. What surprises is the sense of depth that this resonance transmits, as if sounds emerge from a little enclosed space. Furthermore, imagine a constant stream of pulses which inundates you. The second half contains darker nuances: absence of melody, increasing rumblings and (at the end) a penetrating whistle, contribute to give an almost hypnotic listening experience. Although the presence of some compositional elements used in the past by the duo, this work rests upon a simple structure, a few well-chosen components, and probably this makes “Breeze of roses” beautiful, a precious fragment of Celer’s mosaic. As if they can’t stop making music here again a piece of minimal ambient music by the duo Celer. This time based on recordings in a boat on a lake in Austria. As they have done before so many times: one track divided into several named pieces. 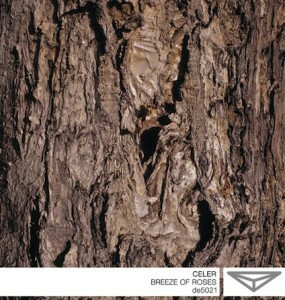 Celer, as active as always, have released an album on Dragon’s Eye Recordings that goes by the name Breeze Of Roses. One track of almost 48 minutes based on a recording done in the belly of a docked sail boat during a holiday in Austria. In 2005 between two rainstorms Danielle and Will, who are behind Celer, recorded an hour long piece with mini-piano, whistles and a cello, while in the background you could hear the water breaking against the boat. For two years this recording was in the box catching dust, but with the memory of their vacation in mind they picked up where they left off. In the process of reworking they recreated their memories into a dark dense piece of music. Not sure if it is really this, but at points you still hear the sound of the moving boat in the water. Because of this the music has a calming touch underneath the dark melancholic drones. During the listening you can recognize the 6 different parts by the use of sounds. At some points there are more clear changes in the music which seem to set in the next part. These 6 parts are carried by one longer structure which returns all the time throughout the piece. This low tuned drone at parts disappears to come back after a while again. Although this release is not so much different from all the other recent releases Celer has done, this release again shows how skilful this duo can play with minimalism. For the fans certainly a release to get. È sul lago Attersee, una delle mete preferite di Gustav Klimt, che gli americani Celer scelgono di ambientare il nuovo album. Allestito uno studio estemporaneo nel ventre di una barca a vela ivi ancorata e attrezzati di flauti, violoncello, piccolo pianoforte e field recordings offerte lì per lì dai rigori dell’inverno mitteleuropeo, i due ne processano l’effetto corale in tremulo composto ambient dal sentore abitualmente malinconico. Diese wunderbar minimalen Sounds sind auf ungewöhnlcihe Weise entstanden. Die sechs Parts auf Breeze Of Roses, eigentlich tönend wie das monotone sirren eiens defekten Kühlschranks zu einem Ambient-Klangstrom geformt, gehen zurück auf Feldaufnahmen in Österreich. Des Ehepar-Projekt Celer hat in einem Gewitter am Ufer des Attersee in einem Bootswrack Aufnhamen gemacht, die die Grundlage für diese CDR bilden. Die Aufnhamen wurden zwei Jahre lang nicht angerührt und dann anschließend in einer Vermischung mit Erinnerungsbildern dieser Reise extremst bearbeitet und verfremdet. Freunde der Arbeit von Bernhard Günter sollten hier unbedingt reinlauschen. Celer consists in Southern California based duo Danielle Baquet-Long and Will Thomas Long who operate enthusiastically on CD-R medium releasing their music in independent labels delivering a string of releases. The duo has released this year six records and this time “Breeze of Roses” follows his dronescapes. This album was recorded towards the end of 2005 when the couple spent some time near a lake in Austria. A mini-piano, whistles and cello were recorded plus some field recordings taken from the lake. In 2007 they retake these recordings and become to work again on them, doing some editing and processing. “Breeze of Roses” consists in six parts of mesmerizing drones and captivating beauty. Minimal electronics and thin layers of whistles accompany this trip to the outerspace. Truly I am blessed. With the new installment in the Four Pieces series out on Smallfish this week as well as the wonderful Engaged Touches a couple of weeks back we’re now treated to another simply awesome release from Celer. Dragon’s Eye is a tremendous label so it’s a real pleasure to be able to bring you this 50 minute work – and it’s a beauty in every way. Celer’s ability to subtly shift their sound from release to release is a skill that I admire. Dragon’s Eye is much more of a minimalist imprint than some of their recent labels and her you get to enjoy at quite possibly their deepest and most stripped back. The resonant atmospheres within Breeze of Roses are superb and it’s one of those pieces of music that gradually builds and flows into several distinct parts. As ever there’s a sense of melody that pervades every moment of this work, but it’s joined by a creeping dissonance that brings into stark relief. Over the course of the album you’ll be gently massaged, lightly challenged and totally invigorated. Another brilliant release from this exceptional duo.